OUR PUPPY PRICES range from $900.00 - $1200.00 . 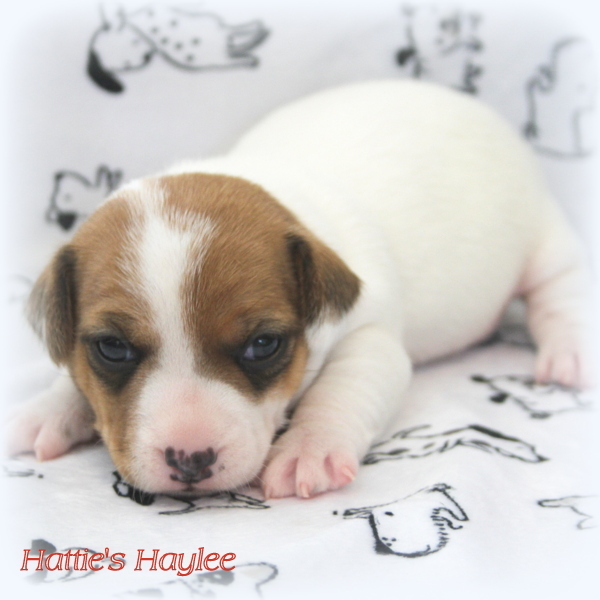 You can secure a puppy from Hobbit Hill Jack Russells for a deposit of $200.00. Our puppies are priced according to quality, coat, markings and conformation. This deposit will hold your puppy until it is 6 weeks old. At that time we ask that you pay for your puppy including shipping, in full. That will give any checks time to clear and we can prepare for your new babies trip home. We ship at 8 weeks depending on the individual. If we have a smaller pup who needs to grow a little more it might be shipped at 9 weeks. We cannot guarantee exactly how tall your puppy will mature or what ear set he or she will have. We will provide you with a picture pedigree that will show you the ancestors of your puppy (if possible) so you can see the type you should get. Our goal here at Hobbit Hill Jack Russells is to work to continue to improve on every generation. Breeding the best to the best and always keeping temperament and loving personalities at the top of our list of priorities. You will always receive a well adjusted, sweet and loving Jack Russell. We do not breed aggressive dogs. Your new puppy will be healthy, well loved, and above all of excellent quality. That is our PROMISE TO YOU!!! Click here to find out about getting your new puppy home. Our puppies are born and raised in our home -not in a kennel setting. We make sure that moms are fed the very best -Purina Pro Plan Puppy food . Our puppies are handled and inspected on a daily basis. Should one pup not be growing as rapidly as he/she should, we will then supplement that puppy with a special formula (not a canned product). We watch our females very closely and feed them accordingly to maintain proper weight. Extra vitamins and supplement are fed as needed. Puppies are seen by the vet at 2-3 days to have a physical. We have their dew claws removed and tails docked at this time. Mother is also examined at this time. Puppies are wormed at 2, 4, & 6 weeks of age. Pups are given their first 5-way vaccine at 5 weeks. They receive their 2nd shot at 8 weeks just prior to leaving for their new home. Puppies come with a complete health record, which includes dates of worming, and vaccines. We strongly recommend that you have your new pet seen by your local veterinarian with in 72 hours of arrival. Your veterinarian will then set you up with a schedule for the remaining worming and shots required to insure your pups continued health care. 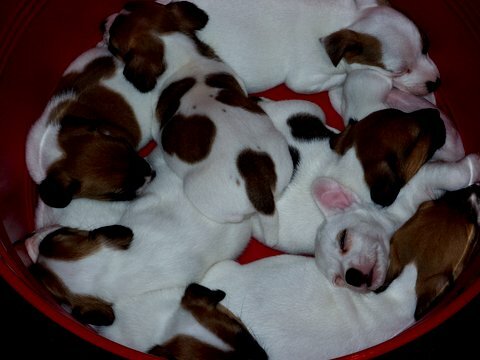 Jack Russell puppies have lots of energy. They do require exercise. Chew toys are also necessary. They play hard and they sleep hard. We strongly recommend that you contact your local pet store or vet to find out about puppy training classes. These will go a long way in helping you be in charge and have a well mannered pet. When puppies are ready to go to their new home, we will go to the extreme to make this transfer go as smooth as we possibly can. We have driven many miles to meet new owners to hand deliver a puppy. We try to do this as often as possible. Should your location not be close enough, we contact the air lines and ship your puppy to the nearest airport to you. Sometimes this means a 3 hour drive to catch a direct flight. If we can ship the puppy out of Little Rock with out excessive plane changes, we ship from here. I just want my puppies to be stressed as little as possible. Getting a new puppy is a very exciting time. Whether you are replacing a long time friend, or becoming a first time pet owner, puppies require attention and care. Watch for anything unusual in their behavior. Puppies can eat most anything and sometimes this can make them really sick. We have had a rock removed from a tummy - bigger than you would think could be swallowed. There were only subtle signs of anything wrong, but it could have been fatal had we not known the dog and his behavior. The surgery went fine and he was back to himself in no time. Work is still in progress on our new kennel. Our internal kennel has been built. It has windows and ceiling fans to help move air thru the building and we are installing a wood stove to keep the dogs warm and toasty on cold winter nights. We also have several outdoor runs where the dogs can get out and enjoy the sunshine. Our puppy complex is a place for moms and babies to move to as soon as the puppies are 4-5 weeks old. There they can roam, explore and exercise. This puppy complex also houses a washer/dryer and commercial grade sink for bathing and grooming as well as a climate controlled environment to assure total comfort for our babies. Extended exercise pens, complete with swimming pools and fun toys are being built to give each individual a place to run and play and spend cool afternoons having fun or laying under the big shade trees. Life is Good at Hobbit Hill Jack Russells. Hobbit Hill Jack Russells reserves the rights to any puppy that we deem necessary to protect the continuation of our blood lines. We also reserve the right to refuse to sell any puppy we feel would be neglected or endangered. Worn out after bath time. Kaddee/Mocara puppies both litters sired by Rabbi. 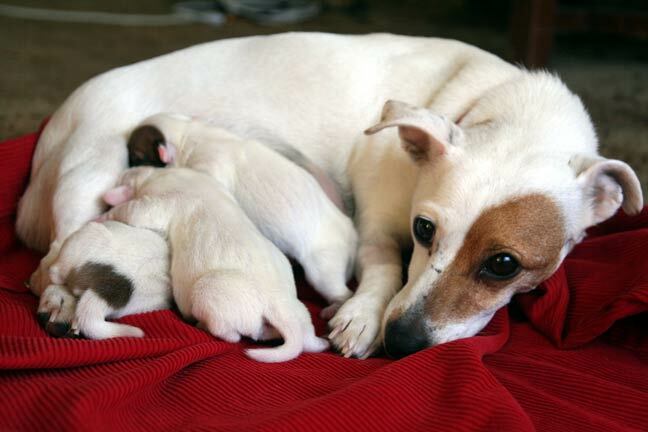 Jack Russell Terriers come in three coat types: Smooth, Broken and Rough. We try our best to represent our puppies to be as we describe them to be. If we say a puppies is a rough coat - we can not guarantee to what degree that puppy will rough. The original Jack Russell's were either smooth or rough. Broken is a term that has been thrown in to describe a dog that has both smooth and rough hair. Rough coats can range from a very light rough to a very heavy or what some breeders are now calling FULL rough. Unfortunately we can't see into the future to know how rough an individual will become. We do know the genetics involved and have a pretty good idea of what an individual will look like from parents and grandparents. I have personally bought dogs that I knew should be rough but looked exactly like many of my smooth puppies at 6-8 weeks. By the time these individuals were 4 - 5 months old we knew they were not smooth coats. It takes time to develop the full coat and many individuals will take as much as 2 years to get the entire coat grown out. Saying all this just to say that coat type and length can never be guaranteed. We do strive to breed our smooth coats very thick, rich and full. A thin wispy coat is undesirable. I will never intentionally misrepresent any puppy I sell period and I will go to the extreme to make my customers happy. Deposits are not refundable but can be transferred to the next litter of your choice. in one of our outdoor exercise pens. 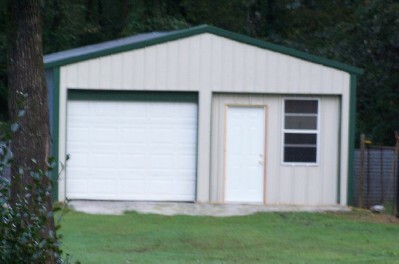 This is the main Kennel that houses most of our adult dogs. We also have several outside runs fenced for the dog to get out and exercise. Moms and babies are in private areas where they can see & hear what's going on but kept safe. Best Vitamin Supplement on the market today. Your new puppy is off to a great start with this product.